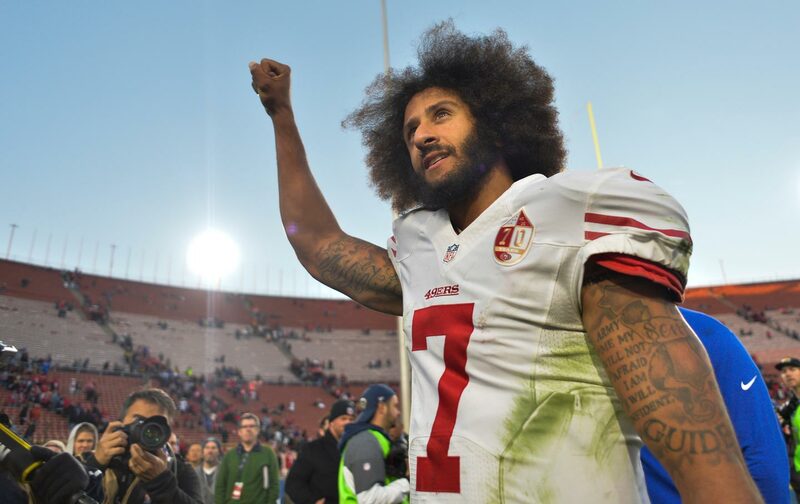 NFL quarterback took his Know Your Rights Camp to the South Side of Chicago. Here is an exclusive look inside. The free breakfasts and the 10 points both derive, intentionally, from the political legacy of the Black Panthers. I spoke with Ameer Loggins, a young writer and PhD candidate at Cal-Berkeley who helped develop the Know Your Rights curriculum as well as the ten-point plan. “This is an extension of the Freedom Schools of the civil-rights movement, the Panther schools, and all non-institutional educational programs that go out into the communities. The only difference is that we are mobile and we are associated with Colin, and that puts it on a different kind of platform.” As this camp was in Chicago, the particulars of the city’s history and policing were central to the agenda. Out came Guillermo Gutierrez and Charles Jones from First Defense Legal Aid, with the message that “Chicago is the false-confession capital of world.” To drive the point home, these “street attorneys” educated the students about Jon Burge, the South Side police officer and now convicted felon who tortured confessions out of more than 200 suspects between 1972 and 1991. Gutierrez and Jones made the students repeat their hotline number—1 (800) Law-Rep4—as well as promise to distribute cards with the number to family and friends. Students asked about retaliation from police if they invoked these rights, concerned that they would be pegged as uncooperative. The First Defense Legal Aid performed skits to show not only how to resist any police coercion but also how to articulate their rights to minimize conflict. The emphasis on healthy choices was evident throughout the day. One of the more harrowing moments came when radio host Ebro Darden asked the students, “How many of you have eaten fast food three times this week?” Almost the entire room raised their hands. Then he asked, “How many of you have members of your family with cancer or diabetes?” Again, almost the entire room raised their hands. The talk of community gardens and, in the financial-literacy section, the importance of dressing and speaking in a professional manner, also produced a robust debate about whether it was realistic for these students to even find healthy food, save money, or dress a certain way, and whether those kinds of personal choices could beat back oppression. It was the century-old debate about what is known as “respectability politics”—whether racism needs to be fought systemically or by changing individual habits. Different speakers articulated different sides of this, with the students chiming in as well. The substance of this discussion was perhaps less important than the fact that the dialogue was open, intense, but also friendly: a display for the young people in the audience of what debate looks like and how adults can disagree without being disagreeable. The students shaped this debate by speaking about their own experiences, what was realistic for them and what was not. The students exploded with joy upon hearing this. I was told there was a similar reaction in Oakland and New York. Afterwards, I spoke to Kaepernick at some length. He is training every day for the 2017 season and, optimistic that his hard work and stellar 2016 season will be rewarded, believes that he will find an NFL home. But we kept the conversation focused on the camp. I’m not worried about Colin Kaepernick. As for “the rest of us,” we’ve got work to do.